Slick Motorcycle Helmet With An HUD Could Eliminate Blind Spots, Provide GPS Guidance, And Make Your Friends Jealous | OhGizmo! I’m in the process of getting my motorcycle license, so I’ve been looking for helmets. Being a geek, I wanted them with some tech. I found what I was looking for. See, when you’re on a bike you don’t normally expect GPS navigation, right? 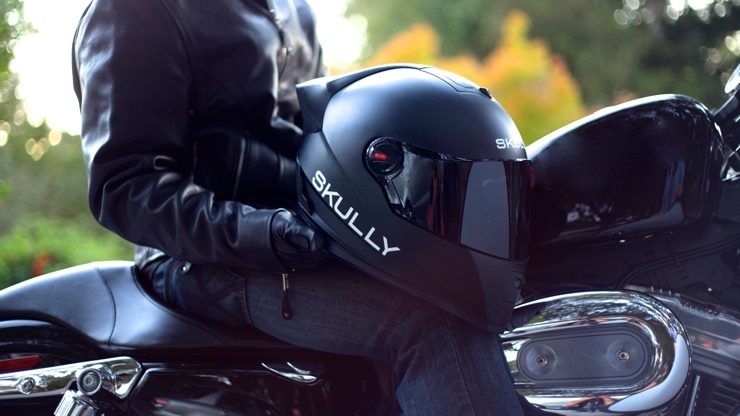 But if you manage to get your hands on a Skully helmet, you’ll get that, and more. Featuring a Heads-Up Display (HUD) that projects an image on the visor, you’ll be able to get turn by turn directions or a standard map view. Better yet, there’s a rear-mounted camera that will display a 180 view of what’s behind you. Gone are the days of blind spots. It runs off a lithium battery which the company claims is good for 9 hours, enough for a full day of riding. It’ll also meet U.S. DOT and European ECE safety standards, so you don’t sacrifice safety for features. Of course it’s likely to be expensive, but there’s no price announced at the moment, and there is a waiting list for beta-testers. I’ve of course applied, and hope to hear back. If that happens, expect an extensive review. I’ve been waiting to see something like this since the GoPro came out.